You don’t have to look far to find Italianità in Mildura and the surrounding district, Sunraysia. Many of you may know of the famous restaurateur from Mildura, Stefano de Piero, not only noted for his fine cuisine at the Grand Hotel some years ago, but also through his series, ‘A Gondola on the Murray’ and various cookbooks. Not so many know about the thousands of Italo -Australiani who contribute to the farming community around the district. Although first generation Italians now make up less that 2% of the population, second and third generation Italo- Australiani make up a significant proportion of the population and have contributed much to the town, its culture, agriculture and the arts. 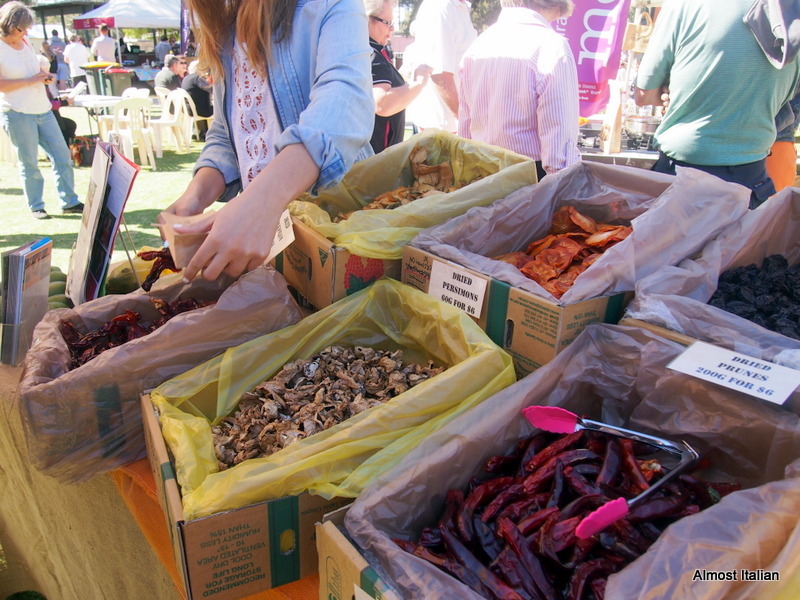 A quick tour around the Sunraysia Farmers’ Market, held every first and third Saturday of the month, will provide you with some irresistible provisions for touring the district. An important consideration, when buying fruit and vegetables, is to take into account any State border crossings. 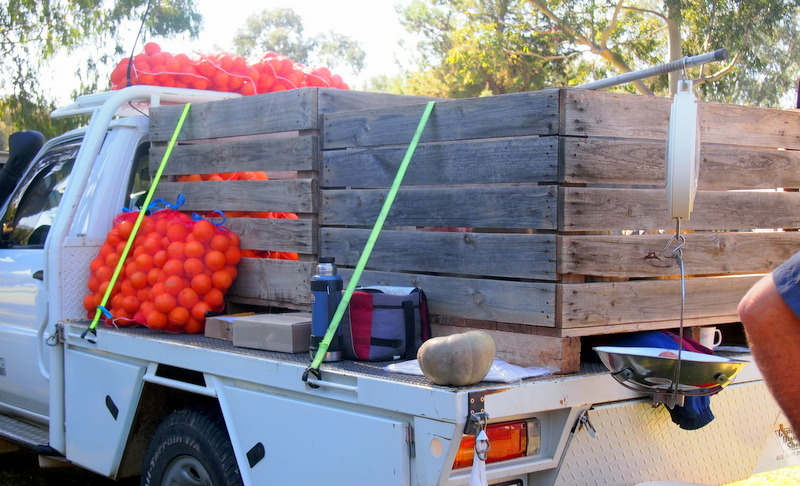 As Mildura sits in Victoria, close to South Australia and New South Wales, quarantine laws demand that one must forfeit most fruit and vegetables on entering another State. This is enforced by officials upon entering South Australia and through signage and the voluntary depositing of goods on entering Victoria and New South Wales. The borders can be confusing upon entering/leaving the Sunraysia district which seems to have some extraordinary quarantine lines within Victoria itself. It’s all about protecting South Australia and the Sunraysia district from fruit-fly. Some demographics from a past census will show that 353,000 Italian migrants arrived in Australia in the post war period, from 1948 through to 1970. Most of the Italian born are now aged over 60. They have kept alive many of the farming traditions learnt from pre-war times and this is particularly evident in preserving techniques and salame making. The wine industry in the Sunraysia district makes up 80% of all Victorian wine grape production. The highways linking Mildura with Swan Hill are lined with farms selling wine, olive oil, citrus fruits, avocados and vegetables. 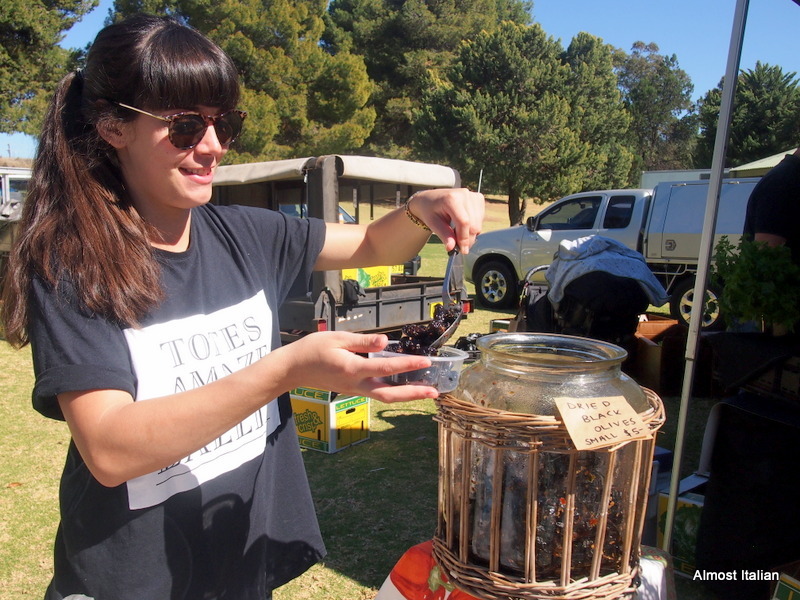 If you haven’t had a chance to visit the farmers’ market, there are plenty of roadside stalls with honesty boxes selling all kinds of fresh produce, on both sides of the Murray river in each state. Are those blood oranges? They look amazing! Yes, we lived on blood oranges for a few weeks while travelling. They make the best juice- you feel like a vampire drinking it. I prefer my blood orange juice in a champagne flute as it’s so special. They are rather odd, aren’t they. Thanks for the link. Not much of a foodie really. However, I made your posted Turkish Lentil Bride soup again last night. Still not red and I used ghee instead of butter. It was delicious. Thanks for that recipe; its a stayer. No worries. More redness can be achieved with a little more tomto paste or its Turkish equivalent, pepper paste which I like in this soup. Bravo gl’Italiani e gl’Italo-Australiani, and bravo to you Francesca for honouring all they have contributed to our country. Thanks Ardy. It is a great district to drive through. Warm, sunny and vibrant, the roadside stalls full of temptation along with wineries and olive groves to visit too. Sunraysia sounds like heaven… wine, fresh produce, olives, markets and roadside stalls. I cannot think to imagine life without Italian influence, how dull it would be. I just know I would buy too much at the markets! It does happen! I bought some tasty dried black olives- never tasted them so good, some pickled eggplant strips done the trad way, and of course a whole heap of fruit which I then handed over to the stern man on the SA border. I simply got so carried away and forgot about the border. Not to worry though. 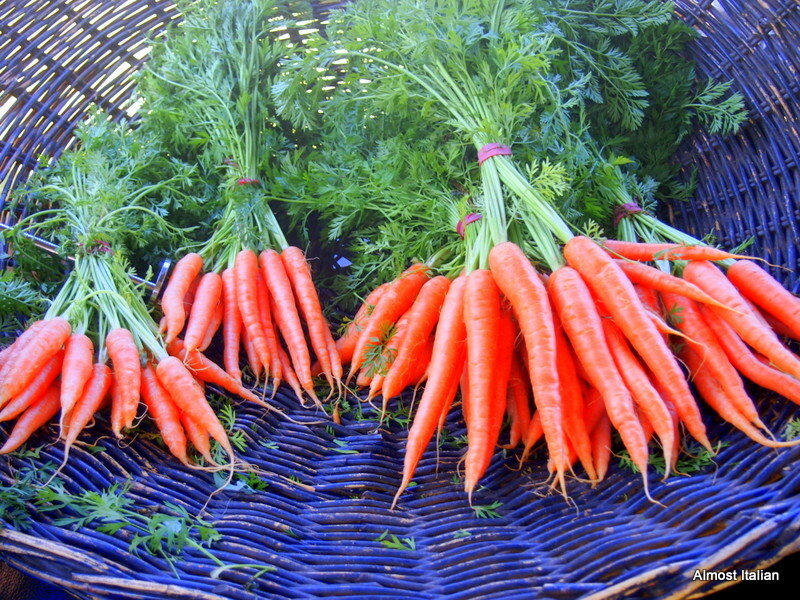 On the South Australian side, the same produce was available in roadside stalls along the Murray there. The blood oranges were the best. I read your post on Buddha hands- nice one and thank you. We missed the market in Victor Harbour and on that day, it was rather windy and uninviting. I think you would enjoy Mildura but it’s an 11 hour drive from Sydney so I guess you have to be committed to a big road trip, or fly. Thanks. I’d try to combine a visit to Mildura the next time I’m in Melbourne for a few days. Hopefully soon. I thought you are in Italy. Looks like an Italian scene. What do people do with Buddha’s hands? They use it to make cedro- a citrus candied fruit.. Wierd looking things! Very interesting what you say about Italian immigrants keeping old farming traditions alive – or at least moving in a different direction from the homeland. I wonder how this affected the Australian Greek community? Although, perhaps they were not farming? A lot to think on. By the way, those Buddha hands are decidedly odd! Gorgeous post, Francesca, that region is on my list for places to visit now I’m retired. 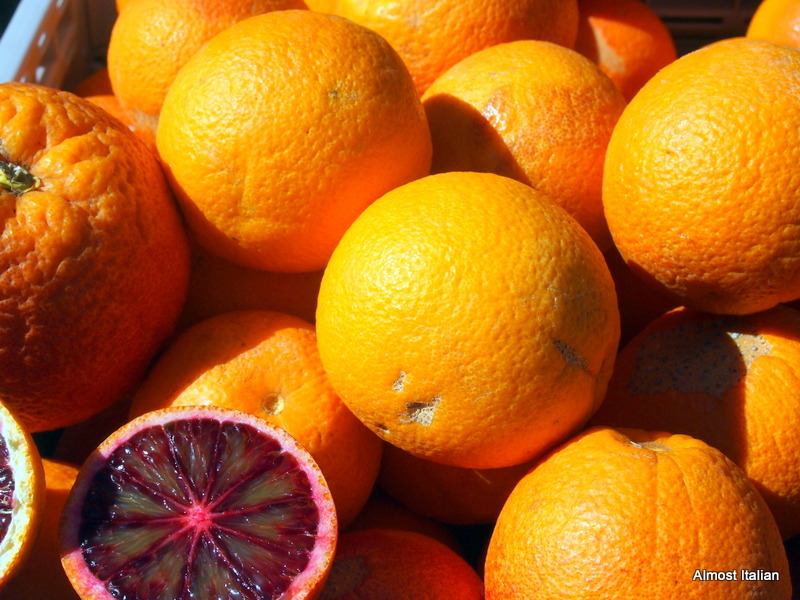 Aren’t the blood oranges divine! I love them so much- and they juice up so well. I have mine in a champagne flute. They deserve it! The Greek community, like the Italian community, have retained many old Greek customs and recipes. I remember learning my first Spanakopita from my friend Demos’ mother in my early twenties. My city neighbour ( when I’m in there) makes all her own pastry, honey biscuits, almond biscuits, hard cake breads, and all manner of things that arrive at our front door because she cooks so much ( She is 84) The Greek community in Brunswick, a suburb near Melbourne, is mostly made up of elderly women: they attend the orthodox church often for all those life and death events, and this involves masses of cooking. I think they all keep each other alive. The other thing which is curious is the retaining of original dialect, even amongst the second and third generation Italians. I met with a great deal of resistance when teaching Italian to some high school students because it wasn’t the same as Nonna or Nonno’s Italian ( invariably Calabrese or Siciliana). There are many regional Italian clubs in Melbourne, the Abruzzo club, the Friulan club and so on. In the end, the oldies had to learn Italian standard so that they could communicate with each other. BTW, the book arrived and I am finding it hard to keep away from it. It looks strangely familiar. Perhaps I have seen it somewhere but certainly never considered reading it until you planted the book in my mind. I love it! The buddha hands are used to make cedro. It is true, we are lucky to have such a variety of influence. Now there are manyTurkish immigrants working in that area, and of course one can purchase a Gozleme from the same market. In keeping with my supposed theme, I like to focus on the Italian input when I can. It is one of the best Farmers’ markets I have been to. We had some good and bad weather Celia. The wind was annoying at times but that happens in spring. I now have my eldest son not only checking on the cows and the chooks, but feeding Celia in the fridge. Won’t be long before he gets sucked into the sourdough making scene! Next Next post: Hunza Pie to the Rescue. Silverbeet.